Diary of an Amateur Vampirologist: Vampire Killing Kit Update! As mentioned previously, one of the dubious Blomberg vampire hunting kits can be found in the Mercer Museum, Doylestown, PA. So, I decided to contact them, to get the lowdown on their famous "artefact". Apparently, there is a vampire killing kit in your museum's collection, allegedly of nineteenth century vintage. Has it been authenticated? It is believed to be one of the compilations of both historical items and "made up" artifacts that found its way into the antiques market sometime in the 1970s or 1980s. We had some portions of it analyzed in the labs of the Winterthur Museum and learned that the "silver" bullets are actually pewter (not a surprise given their lack of tarnish) and that the paper is of 20th century vintage that has been artificially "aged." We use it currently to contrast traditional and contemporary vampire "lore," help interpret the origins of some vampire beliefs, and to demonstrate the use of scientific methodologies in authenticating artifacts. The "1970s" date is contemporary with Michael de Winter's claims, however, the pewter bullets present an interesting conundrum. You see, pewter is "a malleable metal alloy, traditionally between 85 and 99 percent tin, with the remainder consisting of copper, antimony, bismuth and lead." Yet, de Winter says the "silver" bullets in the kit he allegedly manufactured "were difficult to produce due to the higher melting point of silver when compared to lead". Why didn't he just say they were made out of pewter? The Winterthur Museum's analysis is incorrect. de Winter forgot about making the bullets from pewter, or declined to mention it. de Winter lied about manufacturing the kit. The Mercer Museum's artefact is actually a replica of an extant fake. A Blomberg imitation, if you will. And that's the thing. There's no doubt the kit's a fake. As Amsler pointed out, even the paper's been artificially aged. 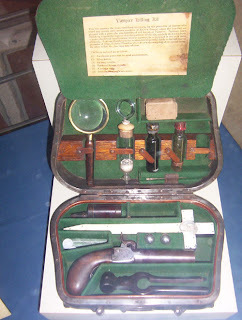 Despite the slight hole in de Winter's account, I'm yet to be convinced any 19th century vampire killing kits existed. Clearly, there was a thriving trade in these fakes, and it gets pretty tragic when the unsuspecting cough up nearly $15,000 for 'em. Word to the wise, folks: if you're gonna spend that kinda dough on an "antique", make sure you get the bloody thing authenticated first! Sheesh.